This is not addressed to any particular person or entity. It is absolutely not addressed to the investigator assigned to Michaela's case at Hayward PD, whose heart is fully invested in this case, or to any of the other individuals who I know and love so dearly. It is not directed to any other individual there either. Luckily, I am not informed when individuals in power are not supportive of the investigation, and I don't ask for this information either. Sometimes I think I am not nearly strong enough of an advocate for my daughter. 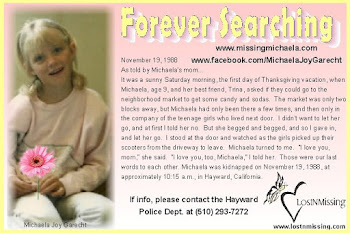 But in general, the Hayward Police Department and the FBI are both supposed to be trying to solve Michaela's case. Let's also bring into this agencies such as the National Center for Missing and Exploited Children, which rakes in over $40 million a year. What exactly are you doing with all this money to help find children like my daughter? No, I didn't think so. I only hope to God that this day comes. And when it does, don't come smiling and holding your hand out, saying how much you care. Sorry to have to post this publicly, but it's been my sad observation that only when the TV cameras are rolling does it happen that this case gets the backing it needs. Personally I think there are far to many people missing in this country. (USA) So many have been found YEARS after the fact as you have mentioned. 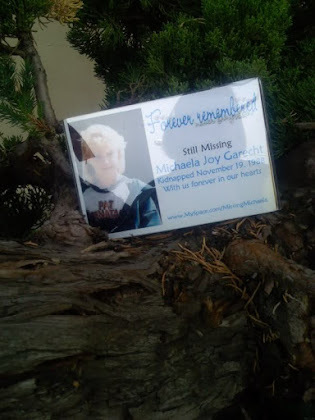 Yet sites like this one for Michaela and other sites of missing people seem to only get attention from the media as in after thought when someone is rescued. I pray one day someone is able to come up with a solution to this problem. Happy Holidays, Sharon!! There have been a number of age progressions done over the years, but there is only one done in recent years. There is not an "other" one. What I was talking about was any age progression being circulated at all. I am opposed to their use because I do not consider them to be accurate. That was so perfect! I agree completely. 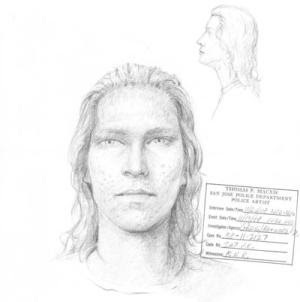 Online are so many sites with people trying to solve cold cases, and cases that are not cold like this one, and they make more progress than most of these centers that take in millions. If it wasn't for mothers like you a large amount of these cases would never be talked about. I find it appalling that the media only talks about this case when the anniversary comes up. That is one of the reasons i love Michelle Knight so much, she gives hope and asks people to never forget the missing. It is clear that many kidnapped children are held captive for years. I am appalled by the numbers of missing children listed on the National Center for Missing and Exploited children website. 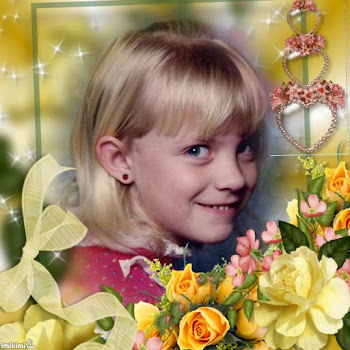 The investigation for a missing child must never stop until the child is brought home. Sharon, first, you're a great advocate for Michaela. Second, I don't think I've ever read you this frustrated about a lack of resources allocated to Michaela's case. Has something happened? Rest assured I love my God too much in my born again nature to intentionally disrespect any one. Plan B , as with all matters of importance, will begin (this Friday) with fasting and much prayer while humbly seeking the fulfillment of the Bible promise found in James 1:5. Once “Wisdom” on specific direction is confirmed I will gather with praying Spiritual Elders (on Saturday) and ask for further discerning verification. Then each step of the way I will prayerfully proceed forward. Right now I am in preliminary preparation of ensuring a pure motive and meek heart. I slowly review the 10 commandments (Exodus 20:1-17) and ask God “Is there anything I need to repent of that is causing a wedge between me and Thee?”. Once the blessed assurance comes I lean with confidence on the Everlasting Arms , enter the Throne of Mercy & petition for specific intervention for Michaela’s case.....Meanwhile please take gentle care. After the holidays, in preparation for what is to come, it will be of* utmost importance *for loved one’s of Michaela to strongly consider focusing on even more of a* health promoting lifestyle*. Ummm ... okay? I'm all for a health promoting lifestyle. The excuse of “not enough funding” to resolve Michaela’s case has continued for heartbreaking years :”( Executive Compassionate Brainstorming in a comprehensive creative manner could change this. Recently OAKLAND P.D. applied for and received a GRANT of $175,000 & had it’s 2nd AUCTION/FUNDRAISOR Sept. 10-26th. If this was done to “promote public safety” & “roadway death prevention” surely with Networking & initiative the important matter of limited funding preventing the resolving Hayward’s Missing Children & Adults cases can be addressed in this innovative professional manner. It's sad that the resources are not there for a SOLVABLE case. It could be a huge PR win if they were to solve this case, and yet after all these years it's really a black eye. And I Dont think Hayward can really afford to have anymore of a black eye. When I was a child I grew up on a farm in a small community. Although an only child, I had a happy childhood. Loving parents, pets and lot of room to run and play. I was home schooled and learned to drive much younger than most kids by learning to drive the farm equipment along side my dad. When I was 23 I married by boyfriend of three years, with in a year we had two children, twins. My dad died when I was 25, my mom died when I was 35. The year following my mom's death I had the task of cleaning out my parents home and placing their farm for sale. In my parents home office I found a folder with several newspaper clips of a missing child from a different state from which I had grown up. It was a folder as thick as your yellow pages regarding this missing child. At first I thought it was odd, and was a little shock. Then I had a sense of dread and fear. 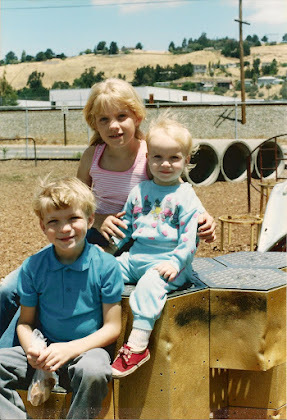 Things about my own childhood I had always questioned growing up flooded my memory. The fact my parents never had any baby pictures of me, and the ones they had started when I was about 9 months old. I looked extremely different than both my parents. When I got my learner permit as a teenager, I didn't have any form of identification with me, not even a birth certificate. My dad simply went with me. The clerk only asked me my parents name, date of birth and address. (This was back in the 80's. It wasn't like today when you go to official government agencies. It was a different area in time, especially in rural country area where everyone seemed to literally know everyone business right down to when they went to the bathroom!) After much thought and conversation with my husband, I took the folder of information and made an appointment to speak with my pastor at church. He tried to calm my fears. He proceeded to tell me that the loss of a parent can sometimes be to much even for an adult child and my mind "running away" with the idea of being a kidnapped child was my way of dealing or not dealing with the loss of my own mother. He tried to dismiss the folder of info I had found in my parents office as my mother/parents for some reason had a concern for missing CHILDREN. I went to my local police department. Detective I spoke was extremely nice & soft spoken. Three weeks passed & I still had not heard from him! When I called he informed me it was still an open case however it was considered a cold case! He apologized for not following up with me, since it was an active case with any new leads, he didn't see the need to follow up with me. My husband & I ended up hiring a lawyer to look into the matter. 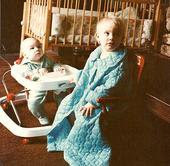 Long story short I turned out to be the child who had been kidnapped in a stranger abduction kidnapping as an infant. I can NOT count the number web sites dedicated to a missing child I have seen that is explaining to that missing child how to "turn themselves" in to get help. It honestly breaks my heart because it is NEVER that simple!! My real parents are much like Sharon. They never gave up hope and had full faith in the police dept in charge with my case as well as other agencies in charge of my case. My parents had those agencies backs 110$%. My real parents NEVER imagined ANY police department would turn me away if I should have happened to had walked into one. Sadly enough I got turned away by my church minister, as well as the deacon, and two police departments!! Then had to spend $250,00 hiring a lawyer as well as paying for medical bills such as DNA test!! No kidnapped person should ever have to go through that!! Yet had I LISTENED to the pastor, and police department and simply said "oh well, my parents just had an interest in missing children." I would still be a missing person and my parents would STILL be sitting here looking for me just like Sharon is looking for Michalea. That is appalling and 100% unacceptable in today's world! Sharon I honestly hope something in this world changes so not only you, but ALL parents can find their missing loved ones!! Honestly, I cannot even find the words to describe how I felt reading your story. OUTRAGED seems to come close. That is really and truly unbelievable. Did you try calling the National Center for Missing and Exploited Children? They rake in lots of cash, so I would hope that they would be helpful. I am glad you persevered and have been able to be reunited with your parents. I can't imagine how delighted they were on that day. They woke up, just like on every other day, only on that day their lives were about to change. Mom in Montana - What a compelling story, it raises so many questions. can you read more about your story on the web, or are you "private" (so to speak)? Personally I don't think Mom in Montana's particular case raises so many questions. In all honesty, her case seems painfully NORMAL in America when it comes to missing children who have been found! If you look at the big picture of ALL missing people who have been found, from Steven Stayner to Jaycee Dugard and EVERYONE in between, that is what raises so many questions. The 'system' in America is quite frankly BROKEN when it comes to missing people, weather it comes to finding them, listening to them or doing much about it. How many times & people did Steven tell? Nobody listened or believed him. How many times did the cops show up at the compound Jacyee was at?!?! 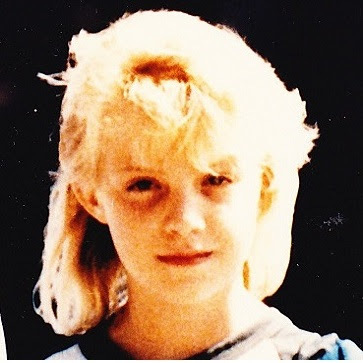 Is it really that big of a surprise that nobody would believe it when a normal, healthy, happily married PTA mom says "I think I was kidnapped" 35 years ago as a baby. It's horrible that happen, however really no big surprise it happen give the number of times this or similar things that have happen when a missing/kidnapped person has been found. Especially if she grew up in a normal home life minus that one detail? Although I am outraged these things happen in America. Flip side of that coin, I am also old enough, educated enough to understand why law enforcement/churches might want to think mom in Montana was just a grief stricken adult women, mom and mother coping to deal with the loss of her own parents. Mom in Montana stated she found newspaper clippings about her own kidnapping & that she was 35 when she found them. Kidnapping that took place that long ago, usually very little if any info is found on the web about it. Usually it's only the reunion story if that that can be found. Given what she went through, I doubt you'll find anything unless she made it a point of going public or sued. I think given the fact she left her comment anonymously and signed in mom in Montana is enough to tell people she wants to be left alone & maintain her privacy. That she also has enough respect for Michaela and Sharon that she doesn't want attention directed off Michaela's site on to one about her and her own life. Sharon I wish you and your family a very Merry Christmas and a safe and healthy New Year. Sharon, I’m thinking of the horrible time you went through waiting for the bone fragment ID with the Speed Freak Killer nightmare situation. You were but one agonizing voice heard in a symphony of collective long term grief. This is one of numerous news links verifying the SPEED FREAKER’s 70 plus victim count :*( Plus the indication of a 3rd team criminal still roaming free!
. 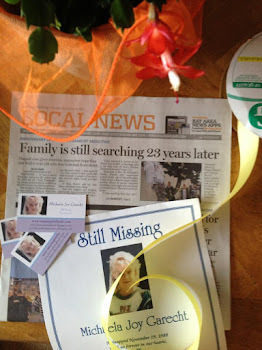 I have become sensitive to heartbreaking views of what missing families go through because of this blog. With dread I wonder :How many more innocent have gone missing since only arresting the two?. & HOW can it be known with certainty that adults were their only target for criminal activity when the remaining deceased well victims & others have not been located? The article is very old, you know. The problem is that you really can't believe what Shermantine says. He may be telling the truth, or he may just be looking for attention, or better yet, field trips. But it is kind of a mystery to me what is going on in the investigation. I heard the FBI was taking it over and they were going to do everything that San Joaquin County should have done, but as far as I have heard they haven't. It does all get very frustrating I have to tell you. I am simmering and stewing here, trying to figure out how to handle all this. But I can tell you one thing, I have decided I am not opposed to lawsuits after all. It is not okay to allow the ball to be dropped at my daughter's expense.